Virtualization, the buzz word which we hear most these days in IT. Reduce the number of physical machines, thus reducing power consumption. Increase space utilization efficiency in your data center. Virtualize Network and SAN interfaces to reduce infrastructure needs. 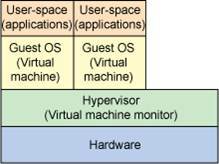 The role of the Hypervisor is supporting Guest Operating Systems on a single machine. 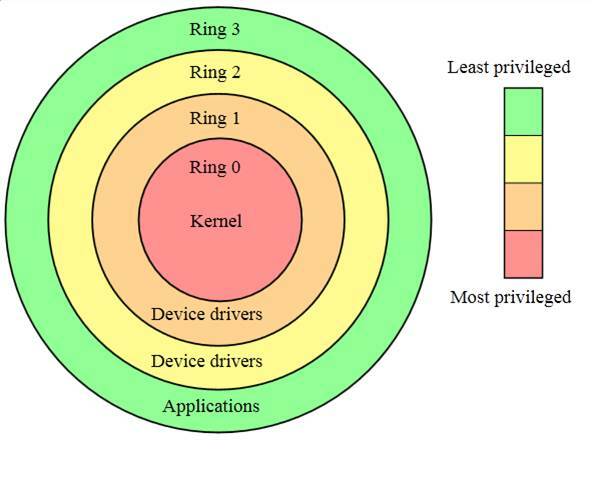 Protection rings is a mechanism to protect data and functionality from faults. Computer operating systems provide different levels of access to resources. Special gates exist between rings to allow outer ring to access inner rings resource is a predefined manner. E.g. : A spyware program in ring 3 is not allowed to start web camera which is in ring 0. In Full Virtualization Guest OS doesn’t know that it has been Virtualized, thinks it fully ‘owns’ the Hardware. Uses a combination of binary translation and direct execution techniques. Non-virtualizable instructions are translated into new sequences which have same intended effect in Virtual Hardware. 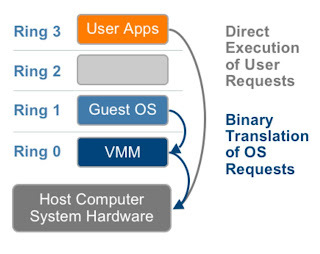 Guest OS is completely abstracted (decoupled) from under lying hardware by Virtualization layer. User Level code is directly executed on the Processor for high performance. 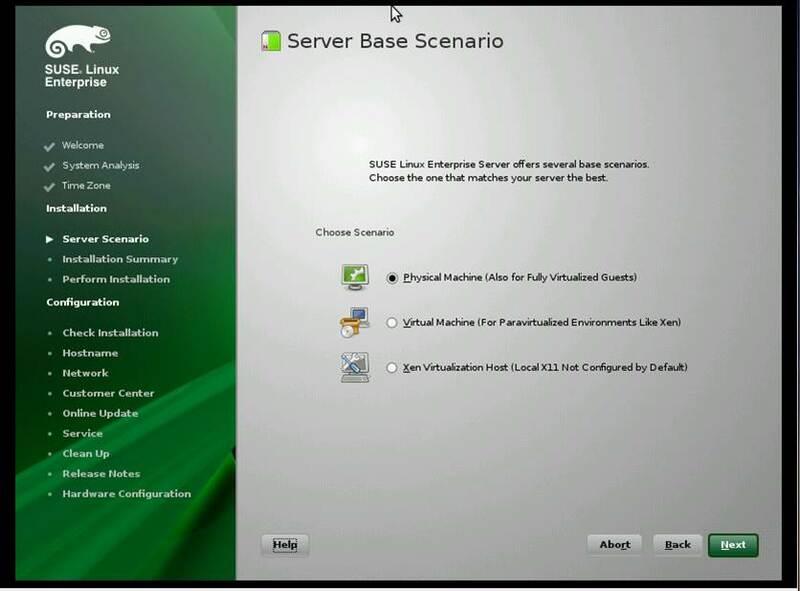 OS level sensitive calls are trapped by VM and executed. Virtual machine monitor provides each Virtual Machine with all the services of the physical system, including virtual devices and virtualized memory management. Here the Guest OS knows that it has been modified to support Virtualization. 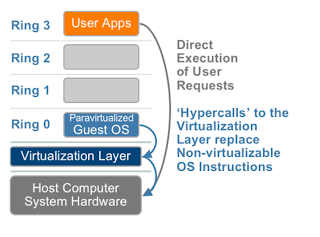 Non-virtualizable instructions are replaced by hyper calls that communicate directly with virtualization layer. 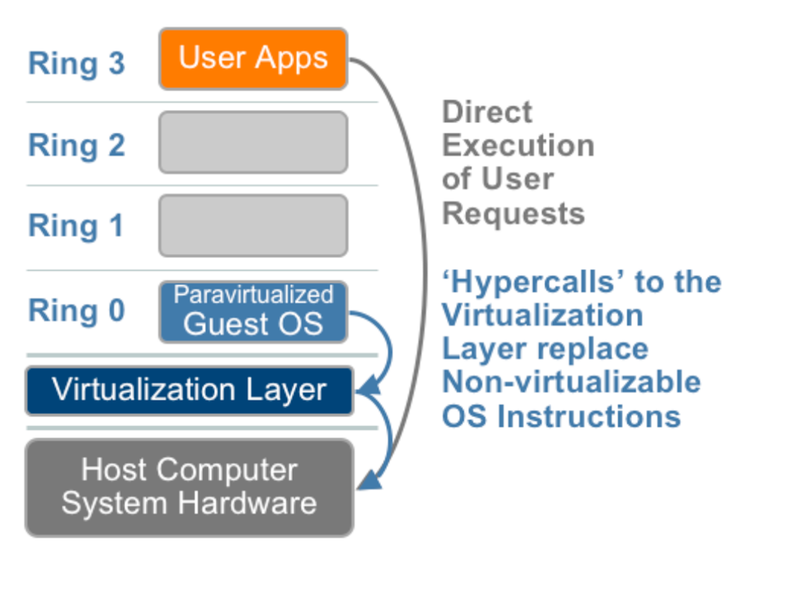 It is relatively easy to modify guest OS to enable virtualization than to develop more sophisticated Full Virtualization. Virtualization support is provided by Processors. 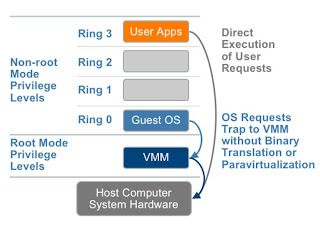 A privilege ring below “Ring 0” is added to support Virtualization. All sensitive calls are set to automatically trap to the hypervisor, removing need for Full and Para Virtualization. KVM is relatively a new comer in Virtualization, but has changed the landscape of Virtualization. 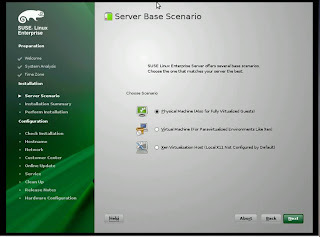 The approach that KVM takes is to turn a Linux kernel into a hypervisor simply by loading a kernel module. A VM can be migrated from one Host to other in no time. VM image should be available on shared storage. KVM introduces new process mode guest to existing user and kernel used for execution of guest OS code. Guest mode exists to execute guest operating system code but only for code that's non-I/O. Within guest mode are the standard two modes, so that a guest operating system runs in guest mode but supports the standard kernel and user modes for its kernel and user-space applications. 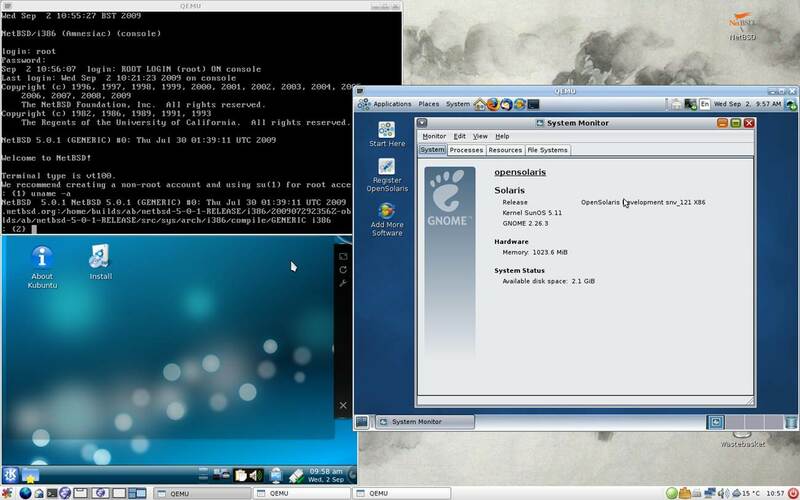 KVM mainly consists of two modules, KVM and QEMU. KVM requires Intel-VT / AMD-SVM processor. KVM module is used for Memory Virtualization. Each guest operating system has its own address space that is mapped when the guest is instantiated. 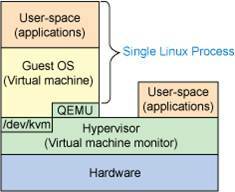 QEMU is used for I/O Virtualization. 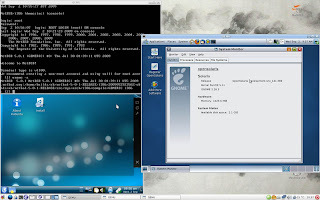 QEMU is a platform virtualization solution that allows virtualization of an entire PC environment (including disks, graphic adapters, and network devices). Any I/O requests a guest operating system makes are intercepted and routed to the user mode to be emulated by the QEMU process. Xen, Bochs, UML, Linux-VServer, and coLinux. Update[10/9/2012] : Sample Code Coverage reports are available here. Code Coverage : Code Coverage is considered as direct measure of quality of code. For example, Consider we have some 1000 lines of code for some utility, which is thoroughly tested. We don't know how many exact lines of code has been tested, here comes code coverage handy. - Helps in determining the test gaps. - To know what extent of code is covered. - Creating additional test cases to increase the coverage. A large variety of metrics exists, many organisations have formal requirements for structural coverage. Code metrics for other languages like C C++ Java can be easily calculated as the code is instrumented. Coming to PERL, here the code is interpreted, here is the catch. There are very few tools to measure code metrics for PERL. Here I will explain the code coverage for PERL using the Perl module Devel::Cover from CPAN. All dependencies should be satisfied before going ahead. This is used to calculate coverage and generate HTML reports. If you have problem with resolving dependencies, try manually installing modules as shown below. If you observer the above code, all i added was one line "use Devel::Cover;" , with which i get code metrics. Lets see the sample run and results. Now a folder is created with name "cover_db", where all the info on runs is saved, now we need to generate reports. "cover" is the utility, with which we can generate HTML reports. All the HTML reports can be customized. bash#ls cover_db Sample.pl Sample.pm bash#cover Reading database from /Coverage/switch/cover_db ----------------------------------- ------ ------ ------ ------ ------ ------ File stmt bran cond sub time total ----------------------------------- ------ ------ ------ ------ ------ ------ Sample.pl 66.7 50.0 33.3 100.0 100.0 60.0 Sample.pm 75.0 n/a n/a 75.0 0.0 75.0 Total 68.0 50.0 33.3 80.0 100.0 62.8 ----------------------------------- ------ ------ ------ ------ ------ ------ HTML output written to /Coverage/switch/cover_db/coverage.html done. Once the HTML reports are generated, the work is damn simple, just open the HTML file in browser. This is just to have quick understanding of PERL code coverage. To understand more, save the above sample files and play around. Labels: code coverage, code coverage for perl, code metrics, CPAN, Devel, Devel::Cover, metrics for perl. In computer terminology refers to bunch of computers. For example we want to make a website/service highly available. knows when something is going to break or fault. Generally a software which manages all these things known as Cluster Server. Availability, minimum configutaion requires 2 nodes. run an application or service. Access, etc the way we configure it. Spam mails are annoying almost all netizens. Sometimes it happens that we need to subscribe to some service (and see what it provides) and we guess/don’t know whether it may spam us. But we are left with no other option than to give our e-mail and subscribe. Here's a good idea to prevent such spam in GMail. In GMail your address looks like your.name@gmail.com and no one else will have email address like you.r.name@gmail.com. GMail has got nothing to do with (. ), it ignores any dot (.) in email address. Gmail doesn't recognize dots as characters within usernames, you can add or remove the dots from a Gmail address without changing the actual destination address; they'll all go to your inbox, and only yours. Sending mail to following will come to your mail box only. username1+something@gmail.com this one refers to the same. If you need to subscribe to some abseexyzee.com and you suspect that it may spam you (and you want to try that), then follow these steps to avoid spam. Login to GMail at http://mail.google.com (use https for secure version) and Click on Settings top right. Just create a filter according to your requirements. 4. Select the option which you want to do. Like delete, mark it as read; apply a label, etc, etc..
5. If a mail comes with username1+test@gmail.com it will be deleted (Depending on what you action you have chosen). NOTE: abseexyzee.com is given only for illustration purpose, i have got nothing to do with this site even if it exists. GMail's new Feature "undo send"
All those who tend to get themselves into unpleasant email “situations” every now and then can finally relax, thanks to an “undo send” feature launched by Gmail. Any user can enable the new feature in ‘Gmail Labs’ under ‘Settings’. If a user feels that the email he just sent should be stopped, he or she should hit the ‘undo send’ button. However, the user intending to stop the mail from being sent would get only five seconds to hit the button. How to fix 'Orkut is banned Virus' ?? Google to reduce history of personal searches. Doctors to store info under your skin.